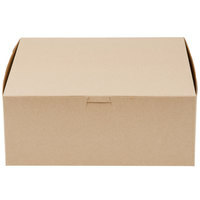 Add an eco-friendly edge to your decadent dessert service with these 10" x 10" x 4" cake / bakery boxes! Made from sustainably managed forests and at least 18% recycled wood fiber, these boxes offer eco-conscious confidence with the convenience of disposability. Great for packaging cakes and cupcakes for any type of celebration, these classic Kraft boxes add a subtle green appeal to everyday deliveries! The box works great and you can't beat the price. The more expensive 10" boxes I've purchased from other sites are easier to construct and have a smoother feel but again, these boxes do the trick for a much more affordable price. This was my first time ordering these boxes. YES, they are cheaper on this site than anywhere else but you get what you pay for. These boxes are very basic, which I expected HOWEVER the tabs are NOT SECURE. The box is flimsy and doesn't seem sturdy enough to hold a half dozen jumbo cupcakes piled with frosting - that can become quite heavy. I have purchased other boxes from a few other places (and always their version of similar boxes - cheap and basic) and none of the other brands have been this flimsy. I will use what I bought because I did buy 100 - but I might try other boxes before ordering these again. They get the job done, don't get me wrong - but i had a box that I was filling with cupcakes almost collapse on me and that is terrifying. I would recommend these boxes to other bakers as long as you understand that these are NOT THICK CARDBOARD like what you are probably used to. A very handy thing for those people who produce cakes to order, the box is strong enough and roomy, later I will order another box. Thank! This is an exceptional product that is: sturdy, not flimsy and definitely holds up to heavy pastries. I own my own bakery and always use this brand for cakes and pastries. Thank you! The items came well-packaged and in very good, pristine condition. Delivery was prompt. The items were as described and of good quality. I highly recommend any cake or pastry manufacturer to get this product. Great for boxed lunches. It held a croissant sandwich, bowl of fruit, chips, and brownie. great price and sturdy! when decorated these boxes are nice. The quality of the box is good, i just ordered wrong size and wanted to know how can i exchange them to get the right onee. These boxes are great! They are very sturdy and super easy to assemble. I use these to package all my cookies and they hold about 30 cookies! very sturdy product. holds several items very neatly. light but durable. product is just as described. 5 stars, i will continue to order this product. We use these daily and wax paper sheets fit perfectly in the bottom of these boxes. They are great to carry out pastries and or sandwiches for caterings. I am very happy with the boxes!! Super easy to assemble and they are really sturdy. They fit my 2 inch cakes with plenty of extra room for the toppings. Couldnt be happier! I love the sturdiness and color of the kraft brown on these boxes. I wish I would have gotten an inch taller (5"), because they're just a tad too small for my cakes. These bakery boxes are great! I use them to hold cookies, 1/2 dozen cupcakes, or small cakes and pies. They fold up nice and evenly. Great items holds up and travels very well. I also use this box for large cookie and brownie orders, and it also holds up to 16 cupcakes. I will be ordering this product again. We use these boxes for our specialty macaron cakes that we make. They are super easy to assemble and hold up well once assembled. We’re satisfied with this purchase. As other reviewers have said, these are a little flimsy. They work fine for cookies or other smaller pastries, but I wouldn't trust a cake in here. The price is great of course! Good basic box that holds a variety of cakes and pastries. We have a stamp that personalizes them. They are easy to put together, and hold up well even if a heavy cake is inside. Good product at a good price. Love this kraft bakery box - it's lightweight, yet sturdy and with the insert securely holds 1 dozen cupcakes. I also bought rectangular cake pads for pastries and 1/4 sheet cakes, and they fit perfectly in this box as well. These are exactly what I have been looking for. They're heavy, solid, and firm. My bundt cakes fit perfect into this box. I will most definitely be ordering again soon. Good size box and easy to put together. Feel that it could be a little stronger but otherwise it is not a bad product to have. These are pretty good. We mainly just use them for samples. They are easy enough to assemble and fairly priced. I will get one with a window next time. So excited when these arrived! We have a packaged baking product and were in search of a gift box for the holidays. This box was more durable than we even thought it was going to be. Can't wait for our customers to see our finished product! Great quakity and price! These are larger bakery size boxes that will comfortably fit assorted pastries. In our cafe, we are able to fit atleast a dozen average sized pastries. I've reordered these multiple times and the last shipment came defected (not thoroughly cut on one corner, the entire bundle). Customer service was able to replace, will continue to reorder. Perfect size for our cakes and doughnuts. We love the kraft boxes, and their natural color. The box is strong, and holds up to the heaviest of cakes. Love the Kraft color boxes. We use these for cupcakes and other bakery products. The height is great for our decorated cupcakes. We use an ink stamper on these for our logos and they look great. These boxes are durable and look good. It also is eco-friendly with no wax coating on the box. I love the selection of different sizes available. Perfect for 9" pies. These boxes are sturdy and love the natural Kraft color. Makes it easy to stamp logo on top of box for professional appearance. Easy to assemble. Love these Kraft Cake boxes. They are perfect for any 8" or 9" round cake. I'm just starting my own bakery business for our local farmers market and the kraft boxes have a great down home feel. I use a bakers twine or ribbon to give it that extra appeal. We use these boxes for a variety of presentations at our bakery. They are great for cupcakes, but also make amazing cookie boxes, dessert selection boxes and much more. We love that we can stamp them. These boxes are fantastic! They are sturdy and easy to assemble. They are a great kraft box color and they fit both 9" and 10" pies! Boxes are beautiful and work very well with my business colors. The natural colored boxes give a sense of elegance to the baked goods. These square boxes are perfect for cheesecakes, pies, and large cookie orders. We love these kraft boxes. They are more difficult to find, we like the quality and look of the boxes. Slightly more flimsy than their white counterparts. Great looking and versitile box. I use these for cakes, deep quiche, stacks of cookies and pastries. Customers loke that they are eco friendly and grease proof.